Injecting your business with clear, compelling words written by a professional copywriter could prove to be a smart move. And in this post we’ll look at why. But first let’s consider why copywriting may not be on your list of priorities. As a successful small business owner you’re very close to your company. Developed a product or service that people want or need. Built up a core of loyal customers who choose you over the competition. Created a reputation as an expert in your niche. Worked extremely hard and made lots of sacrifices. Without doubt, you care a great deal about making your business successful and profitable. After all, no one knows your products and services as well as you do. And by writing your own words you’ll save money. But are you making these two common copywriting mistakes? Writing copy from your perspective instead of the customers’ by using words like we and us instead of you and your? I call it self-promotion. Promoting product/service features instead of benefits? What’s more, did you know these mistakes could actually cost you sales? Take the short cut and hire a professional copywriter. Hiring a copywriter is good news for your business. A professional will write words that are more likely to get read by your prospects… Here’s why. And that’s invaluable because it ensures your business is pitched to appeal to your customers. And more interested customers equals more sales. In a nutshell this is how copywriters can add value. So next time you need some hard-hitting words to promote your company, let a professional copywriter do the hard work for you. It will save you valuable time meaning you can focus on doing all those other jobs only you can do. 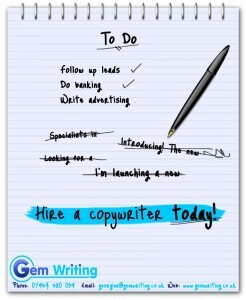 And perhaps you too will discover professional copywriting is a sound investment that could help your business GROW. 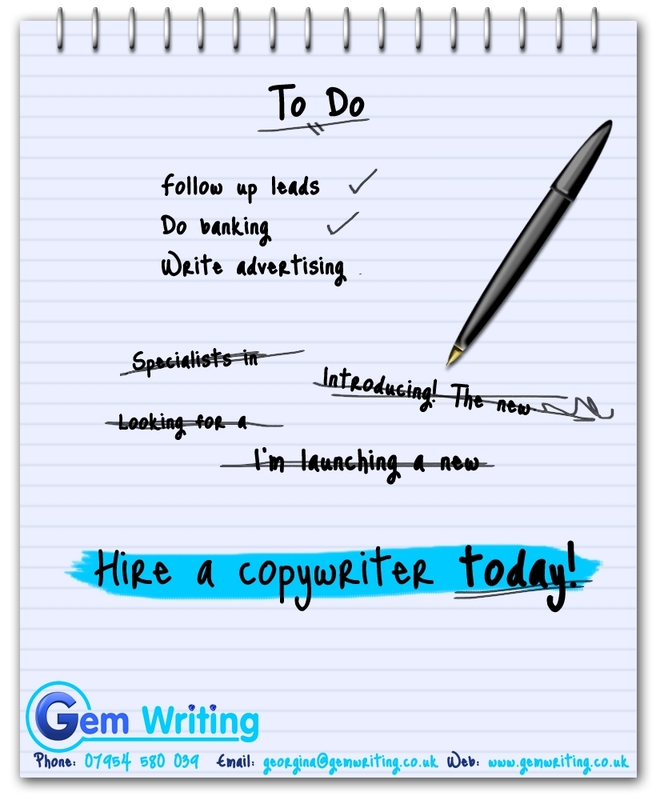 P.S: Why not check out my copywriting services to discover how Gem Writing could help market your business. Alternatively contact me for chat about your requirements. There’s no obligation. I look forward to hearing from you. A good post and always a good idea to push this concept. I say to my copywriting clients that they wouldn’t expect me to be good at physiotherapy, or designing retail environments, or whatever it is that they do, so why do they expect themselves to be good at all the other things that go with running their businesses? I really agree, too, that we’re good at picking out benefits rather than features – and by asking “why” about things we’re not familiar with, we know the questions their clients might ask, and can make sure we answer them. Hi Liz, thanks for the comment. That’s a really good point about how our questioning can encourage clients to see their products or services from a client’s perspective. Great post. So many businesses (about 90% is my very subjective guess) make the two mistakes you highlight – talking about themselves, and focusing on features. They have a good product/service, then blow it. It’s tough trying to help them because if you point this out they think you are trying to “sell them”. Most of the time I’m just trying to save them from themselves! Hi Jim, thanks for your comment. I agree, as copywriters we aim to ensure the words used to sell products and services appeal to the target market and do the business justice.